This October the Annie Moses Band will be going on tour with Selah! This amazing group has had multiple number-one hits and has sold over 3 million albums. The tour will be sponsored by Holt International. Check our tour schedule to find a date near you! This September you can get The Song of Annie Moses and the AMB's latest album Pilgrims & Prodigals in stores near you! Support the mission of Annie Moses and experience this spectacular musical and literary offering! Check out the behind-the-scenes of The Song of Annie Moses at RobinWolaver.com! The Song of Annie Moses Available in Stores Near You! Hey Everyone! The Song of Annie Moses hits streets today! Check it out at Barnes and Noble, Lifeway, Books-a-Million, Sam's Club, Amazon.com and more! Go support our mission and add a spectacular, entertaining, inspirational book to your library! Check out interviews, articles, and excerpts at RobinWolaver.com! Click here to learn more about this enthralling story! Robin Wolaver and AMB in Guideposts Magazine! Hello Everyone! We are excited to announce that the Annie Moses Band and Robin Wolaver will be featured in the September issue of Guideposts Magazine! This special article will focus on The Song of Annie Moses, Robin Wolaver's new literary offering, and will include never-before-seen photos! Check it out at Guideposts.org or your local bookstore! Learn more about Robin Wolaver and The Song of Annie Moses at RobinWolaver.com! We are excited to announce that Robin Wolaver will be touring to Barnes&Nobles near you during August-September to promote the new book, The Song of Annie Moses. Don't miss this exciting opportunity to get your own signed copy and speak with the author about her musical and spiritual message. Keep posted at AnnieMosesBand.com and RobinWolaver.com for new book tour dates! Our family has been given a precious addition this year! Berklee and Alex had their first little baby girl, Audrey Jane Wolaver, on September 7th. She is a continual delight, getting plump and pudgy and bringing immeasurable joy into our lives! A true little lady. We have dreamed for years to perform in Carnegie Hall, and we were blessed beyond measure in 2012 to see that dream come true in a performance with the North American Choir and Orchestra. NYC in January was definitely chilly! The show was an amazing experience, and so was the cruise on the Hudson afterwards! Many thanks to all who participated with us! 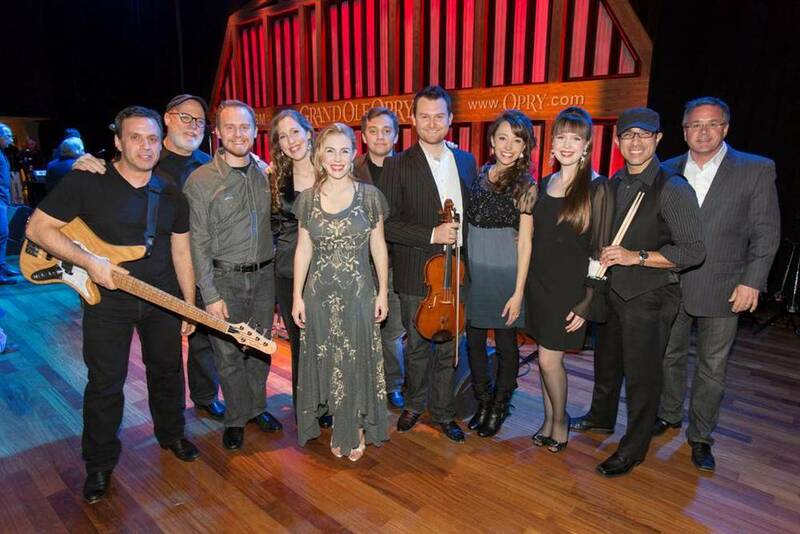 In November we performed on the Grand Ole Opry at Ryman Auditorium. It was quite a moment to stand on that stage for the first time! We were blessed with a standing ovation after playing 'God Rest Ye Merry Gentlemen' for the packed house, which was just amazing. It was an awesome night! This year's Fine Arts Summer Academy was undoubtedly the best yet! The Younger Division culminated in the final show "Poems, Prayers, & Promises", a fun and touching musical about the Word of God. We got to work with truly amazing young talents! The Upper Division Gala show 'Quo Vadis' was absolutely phenomenal. It was the first year for the Gala show to be held in Allen Arena on the Lipscomb University campus. The students gave their best and the Spirit of God truly visited us! On October 2nd, the long awaited Pilgrims & Prodigals was released to stores. We are excited about this newest project and look forward to touring the music in 2013. To order a copy just hop over to the store page! The first single from Pilgrims & Prodigals, Blush, is a song dear to our hearts. We were given the opportunity to partner with the amazingly talented director David Kearn for the project. It was a blast to film our first ever music video on location at Rippa Villa, a Civil War mansion in the heart of the Tennessee hills. Click here to watch the Blush music video. As always, Christmas was the highlight of our year! We toured all the way from Texas to Florida to Louisiana on the three week tour. For the first time this year we had the Ultimate Christmas Collection, which is very true to its name! The box set contains four CDs and two DVDs, including our newest Christmas offering, Christmas Comes Softly, the meditative, intimate album of beloved Christmas carols. Thanks to God and to everyone who made 2012 such a wonderful year. We look forward to what 2013 will bring! Happy New Year to you all!